Welcome to the academic homepage of Wolf-Georg Zaddach! If you’re looking for my work as a musician and composer, please click here! 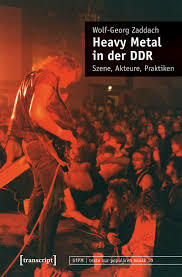 [Aug ust 2018] New Publication: Heavy Metal in der DDR, coming out September 2018! [March 2018] New conference and workshop appearances in 2018: Siegen @ Hard Wired 6, for a 3Sat-report see here, Stendal about youth cultures in the GDR, Berlin/Macromedia about Music Business Studies. [November 2017] New book about jazz analysis and theory as Co-Editor. I provided chapters analyzing solos by Michael Brecker, Chris Potter, and Branford Marsalis! The book is available as open-access publication / free download. [February, 26th 2017] Dissertation about the metal scene in 1980s East Germany officially submitted! Also, new conferences scheduled: Besides Olomouc/Czech Republic in March, I will present my research in Budapest/Hungary in May and Helsinki/Finland in June! [January 17] I got an invitation to present at the „Popular music in communist and post-communist Europe: state of research, perspectives“ at the Palacký University Olomouc, Czech Republic, March 28th – 29th. I’m really happy about that and looking forward to present about my research on metal in the GDR. [January 17] Here’s an interview about my research on metal in the GDR (in German), by the newspaper Ostthüringer Zeitung. I did that a while ago and just found online. Many thanks to Tatjana Böhme-Mehner! [October 16] Autumn is going to be busy again! Three guest lectures (Hochschule für Musik Weimar, University of Southern Denmark Odense, Stiftung Ettersberg) and two conferences (Surrey/UK and Hamburg) – See below! [April 16] I’m delighted to announce that I’ll be providing a chapter about „Heavy metal in Germany“ for the upcoming Bloomsbury Encyclopedia of Popular Music of the World, vol. VIII-XIII, edited by John Sheperd and David Horn. [March 16] This year is going to be interesting. Besides finishing my Ph.D. in late summer /early autumn, I’m going to present at a lot of interesting conferences this year, check the presentation section below! [Jan 16] New publications, among them two international and double-blind-peer-reviewed, are going to be released this year, check the publication section! International GSA (German Studies Association) conference, Kansas City/Missouri (paper: A Question of a German Sound? Guest lecture „Kiss the demon. zum dissonanten Verhältnis von Black Metal und Christentum“, Ilmenau | guest lecture at catholic students community, Ilmenau (paper given: kiss the demon. conference „Geschichte wird gemacht: Zur Historiographie populärer Musik, 23. Arbeitstagung des Arbeitskreis Studium Populärer Musik e.V.